Since Toyota won’t just spit it out and show us the car, we get to learn one fact about the 2019 Toyota Supra at a time, slowly piecing it all together like a giant jigsaw puzzle no one asked for. The fact of the week is that the Supra will likely have torque on par with the Lexus F cars but weigh 400 to 600 pounds less. Because “torque on par with the Lexus F cars” doesn’t come right out and say it, the numbers are around 400 lb-ft of torque in Lexus’ performance lineup. That performance lineup also weighs around 3,700 to 4,000 pounds, and the chief engineer on the new Supra, Tetsuya Tada, told Autocar that the car will weigh about 440 to 660 pounds less than the ones in the Lexus F lineup. 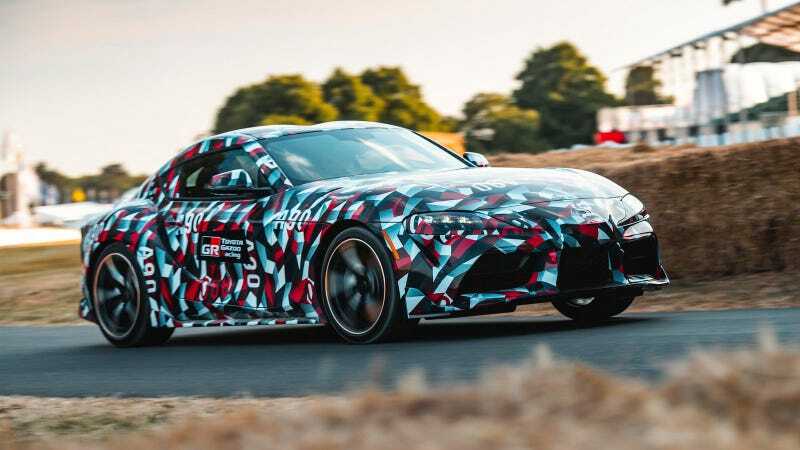 This backs information recently leaked onto the web that claimed that the Supra will weigh 1496kg, making it 250kg heavier than the GT86 and 14kg lighter than the fourth-generation Supra, which went out of production in 2002. This would also make the car 14kg lighter than a PDK-equipped Porsche 911 Carrera S, with which the Supra’s expected 0-62mph time of 3.8sec would make it most comparable. Less weight and a high-performance engine is always a good thing, even though Autocar only got hints about torque from Tada—not power. Toyota confirmed last week in its remarkably slow Supra rollout that the car will keep the tradition of an inline-six engine and rear-wheel drive, but that was enough information for then, and nothing further was said about what that engine could do. The slow, trickled rollout of the new Supra started at the Geneva Motor Show in March, when Toyota debuted a concept race car to announce Supra production and released no actual power specs on it—to the point that we all had to learn its 591-horsepower figure from Gran Turismo Sport. No real information about the production car came out for months, until Toyota announced that it would debut at the Goodwood Festival of Speed last week. A Supra came out in a camouflage wrap, referred to by Toyota as a “development” model. Then, we got the hints of torque and weight numbers from Tada in an Autocar report over the weekend. Four months after Toyota said the car was a go, we now know: There is a Supra, it’ll eventually lose the camo, it’ll have torque near Lexus F levels but weigh a lot less, it has an inline-six, it’s RWD, there’s almost no way it’ll get a manual transmission, and it’ll come onto the market during the first half of 2019. Wouldn’t it have just been easier to come right out and say that—all at once?